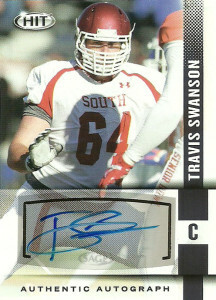 Travis Swanson played for the Arkansas Razorbacks. He moved to Center (from Tackle) and took over as the starter at the position for the program in 2010. He’d anchor the Hogs line as it set school offensive season team records as he started the next 50 games. Swanson really fit the mold of a zone blocking lineman going into the pros, and as there were not that many highly touted centers coming out of the draft so this made Swanson an excellent value find. The Detroit Lions selected him with the 12th pick of the 3rd round of the 2014 NFL Draft. He fit in well with their scheme, and started 5 games in his rookie year. In 2015 Travis was given the starter’s nod, and after 14 starts, ended his season on IR due to a shoulder injury. Since then Swanson has demonstrated versatility in the Lions offense to play both guard and center, and has started 23 contests over the last two seasons.